Make this Salvador, Bahia Rental your choice today. 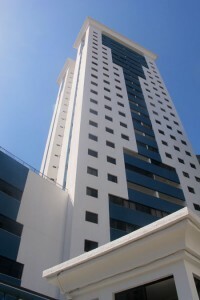 The tunsteelebrazilapt in Salvador, Brazil. The views are breathtaking and the breezes are delicious. Come and enjoy the clean, bright space on the 18th floor. The three bedroom, two bath apartment with new linens and Ralph Lauren towels. Fully equipped kitchen with range, oven, microwave, refrigerator coffee maker,etc, though cooking is unnecessary with the many affordable restaurants nearby. The luxury building boasts a private pool and exercise room on its recreation floor. The excellent location is only a five minute walk to beach, has many amenities, including a gym and pool. Situated in the historic center of Porta da Barra. The apartment is a block away from the popular beaches. The historic Lighthouse and Fort just a short walk along the beachfront promenade. Grocery stores, fruit stands and bakeries line the historic streets.